In addition to being a stressful life event, divorce brings plenty of financial and practical repercussions. For instance, you and your spouse may not agree on who will have custody of the children or how you will divide your assets. When you need help in handling the legal aspects of your marriage’s dissolution, a divorce lawyer in Granville County, NC can be your guide. At Eatmon Law Firm, we are committed to helping our clients achieve the best possible outcome in their divorce claims. When you turn to us, our divorce lawyer in Granville County, NC can help you choose the most appropriate approach for your situation as well as assist you in finding ways to strengthen your case. A divorce lawyer in Granville County, NC gives professional advice. For many people, divorce can be a complicated and confusing process regarding legal forms. Fortunately, a divorce lawyer in Granville County, NC can help you navigate the complexities of matrimonial law and family court. With the help of a divorce lawyer in Granville County, NC, you will know how best to present your case and what documents and forms you’ll need in a court of law. Your divorce lawyer in Granville County, NC will guide you through these murky legal waters and adequately prepare you to face the court process. A divorce lawyer in Granville County, NC provides an objective view of your case. During a divorce, you may feel sad, angry, afraid, confused, or betrayed. A divorce lawyer in Granville County, NC can keep you from letting your emotions cloud your judgment. Your divorce lawyer in Granville County, NC will give you objective advice on how to move forward with your case. When emotions get the better of you, you may end up saying or doing things that might affect the outcome of your case. A divorce lawyer in Granville County, NC can keep you from making impulsive decisions. A divorce lawyer in Granville County, NC can recommend various options. During a divorce, the opposing parties will have to make decisions that greatly affect both of their lives. If you and your spouse are having trouble agreeing on the terms of your divorce, you may need the help of a divorce lawyer in Granville County, NC. As an expert on matrimonial law, a divorce lawyer in Granville County, NC can make a settlement proposal for you. A divorce lawyer in Granville County, NC can discuss different legally acceptable options for your case. Whether you are negotiating child custody, alimony, or estate distribution, your divorce lawyer in Granville County, NC can propose choices that may help resolve the areas in dispute. A divorce lawyer in Granville County, NC helps set your priorities straight. In a divorce, both sides will have to make compromises. A good divorce lawyer in Granville County, NC will advise you not to waste time or resources arguing over insignificant issues. Your divorce lawyer in Granville County, NC will remind you to focus on fighting for the more important matters. 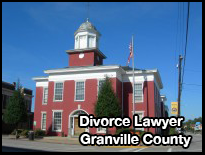 A divorce lawyer in Granville County, NC can handle the paperwork. A divorce case entails a lot of paperwork, which can be tedious. Thankfully, a divorce lawyer in Granville County, NC can help you gather all the information and secure all the information for your case. Preparing the paperwork is essential, as the judge will depend on these documents when making his or her decision. Leave the paperwork to your divorce lawyer in Granville County, NC. No matter the circumstances of your divorce, Eatmon Law Firm will strive to help you get a fair settlement. Our divorce lawyer in Granville County, NC will evaluate your situation and present your case to court if needed. Visit our website today to learn more about our divorce lawyer in Granville County, NC, and our services. In 2005, Ms. Eatmon graduated from Campbell University with a degree in law. Not long after, she became an associate in Wyrwick Robbins’ family law section. Over the past years, she has written several family law-related manuscript forms. Divorcing spouses have the option to settle matters outside of the court of law. Negotiation, mediation, and arbitration are types of alternative dispute resolution that allow spouses to reach an agreement without going to litigation. We can help you determine which of these forms of ADR are suitable for your situation. At Eatmon Law Firm, we practice and commit ourselves to providing our clients with compelling and practical legal advice. We will work hard to help you achieve the best possible outcome for your situation. If you are interested in obtaining our services, reach out to us. To schedule your initial consultation, give us a call at 919-435-0565. We look forward to working with you.